Standard model with high-performance, high-quality design and variety of safety features. Instrument holder which can move freely is easily set above the patient lower chest position and it allows doctor to take comfortable treatment style. -The spittoon maintenance is simple with automatic draining function. -The water circuit of instruments are cleaned at once with running water. It prevents the choking in water circuit of inside the instruments. Note: The water receptacle tray in the photo is optional. -LED light which illuminates the operation field is installed as standard feature. -The turbine speed is adjustable in three steps and provides smooth treatment. -The range of micromotor speed is from 100~40,000 rpm. and applicable to wide range of treatment. By combining use with instrument memory, the pleasant treatment can be performed matching to the treatment contents. 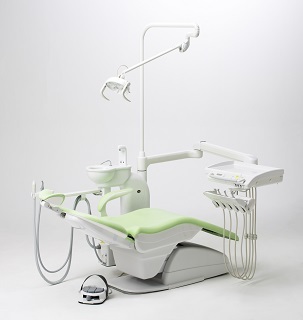 Smily Inicio is the basic style of dental unit of OSADA and versatile for various conditions. -Overarm type responds to wide range of treatment. It responds to any kind of situation and has Contour seat type and Step type. Note: Step type has step-down trans box attached separately. -Floor mount type is appropriate for patient to take the front entry/exit for the seat. It is recommended for the clinic set up where the flow lines of patient and doctor are separate. For floor mount type, only step type is available. Note: Step-down trans box attached separately. *The product colors shown here may look different from the actual colors as shown here by digital display. *The product is subject to change without prior notice for improvement. *The photos shown are images. © COPYRIGHT 2014 OSADA GROUP. ALL RIGHTS RESERVED.